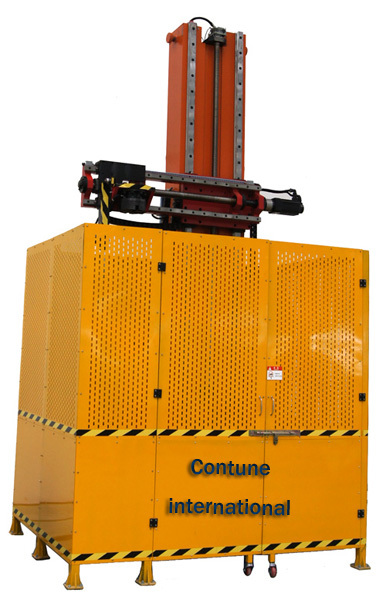 What is “Insulator bending & torsion resistance testing Machine”? The bending torsion testing machine is mainly applicable in the mechanical bending (cantilever) and torsion test for post type insulators and pin type insulators with material of porcelain and polymer. As it is required in IEC standard and ANSI standard, porcelain post insulators for subsation and overhead transmission line should bear a certain mechanical load. This mechanical load include bending load and torsion load. (Sometimes it’s also called cantilever load of post insulators) So it is the same with polymeric post insulators. Polymer post insulators with epxoy resin core has appeard for decades, though the specifc standard of which has not been defined, it is also required to be tested as ceramic post insulators. 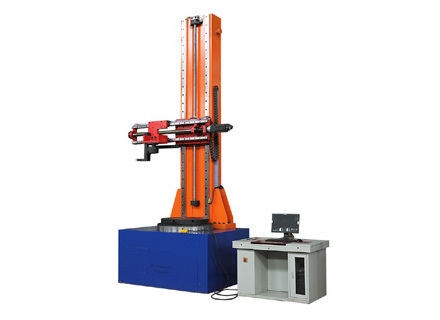 This bending & torsion testing machine will meet this demand. As you can see in the figure, post insulator specimen shall be fixed on the bottom base with flange. In the vertical direction it is adjustable to adapt different insulator with different height. A moveable device will push from horizontal direction and record the process. This machine provides a maximum bending load of 50kN and maximum torque load of 8 to 30 kN with different model, which can cover all types of common insulators and fittings. 1. By using single servo deceleration structure to achieve the functions of bending and torsion test, it has largely simplified main body and reduced failure rate and controllability has been greatly improved. 2. The whole system has better stability and much better controllable accuracy than ordinary hydraulic system, it has lower noise than ordinary hydraulic system as much as 20 db. 3. The bending & torsion device on movable transom is free to move in either directions, left and right, which make it easy to install. 4. This tester is also available for specimen with small mechanical load. Bending test can be done in 4 directions with bottom base rotatable,which enables you to perform insulator bending tests conveniently from different directions. Insulators are fastened on the base with bolts and nuts to simulate real insulator environment. This machine is powered by electro-hydraulic servo and controlled by computer automatically,which enable its high accuracy of 1%. For safty consideration, a protection mask is necessary in case of fragment during the testing procedure. Contune International has well prepared it. This bending&torsion tester is controlled by software on computer. With virtual panel on screen,it enables operator to observe the testing procedure easily. Live curve shows the change of testing force and tests can be stoped anytime for observation. The results can be saved, printed and recalled,enabling inspectors to note amd compare. What’s more, our software are optional in multi languages: Chinese, English, Espanol, Russian. If you have customized demand,please tell us.